Our site offers the possibility of booking a car parking space in alternative car parks near Naples port. These car parks offer free return shuttle bus transfers to the port. Alternatively, a Meet and Greet Service is offered where your vehicle is dropped off and picked up at the port itself by car park staff. 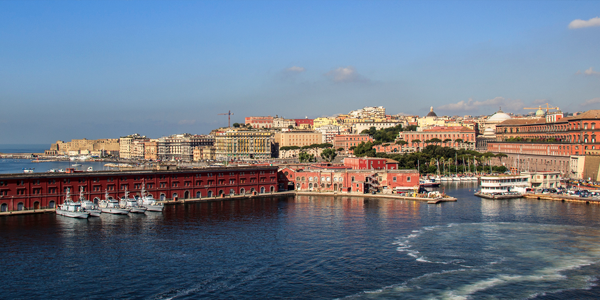 Transfers from the car park to the Port of Naples operate to the different piers and also to the Ferries. The prices for the car parks listed for Naples port parking are the lowest and extremely competitive. Booking is easy and quick and guarantees a parking space. The port of Naples is an international cruise port that connects the city with the Mediterranean and the Middle East, but it is also the main hub for the islands of Capri, Procida and Ischia and the Amalfi Coast. The Port of Naples has been under development to provide parking near to the Beverello Dock. The cruise terminal now has seven piers for large cruise ships to dock. The car park at the Port of Naples is not currently bookable and there is no precise information regarding its cost or availability. The Port of Naples is only minutes away from Naples Central Station and from the motorway toll gate it is only 15km away from Capodichino International Airport.